Indian smartphone manufacturer Ziox Mobiles has launched a new smartphone in their Astra series. The Ziox Astra Young 4G has been launched without any fanfare on the company’s official website. The Ziox Astra Young 4G is trying to best to compromise between performance and price and it sadly misses the mark by a long shot. The Ziox Astra Young 4G does start with a good note due to its 5inch FWVGA resolution display which is encased in Dragontrail glass. It seems to be one of the few smartphones in the sub-Rs. 5K range to have protective glass covering. You have to note here that more expensive smartphones like the Redmi 4 series do not have any protective glass covering. 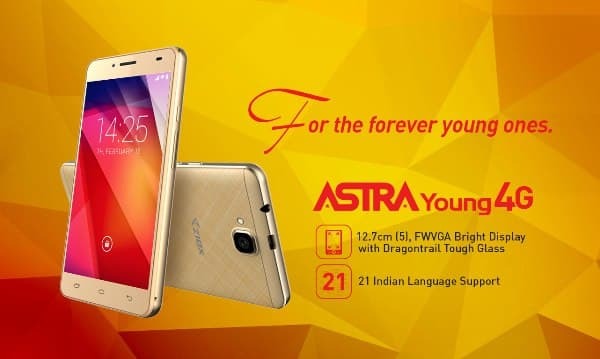 The Ziox Astra Young 4G has support for 21 Indian languages. The Ziox Astra Young 4G comes with a textured back so that it does not slip away from your hands. The Ziox Astra Young 4G however falls completely below expectation when it comes to its innards. It has a 1.3GHz quad-core processor which seems pretty standard for a smartphone in this price range but it coupled with 512MB of RAM. This means that the Ziox Astra Young 4G will not only fail in multi-tasking apps but also struggle to run RAM heavy apps. The Ziox Astra Young 4G has an internal memory of 8GB and it does not mention in the spec list if it supports microSD cards for memory expansion or not. The Ziox Astra Young 4G runs Android Marshmallow and supports 4G VoLTE. The Ziox Astra Young 4G has a 2MP rear camera with LED flash and a front VGA camera for selfies. The Ziox Astra Young 4G houses gravity, proximity and light sensors within. The Ziox Astra Young 4G supports Wi-Fi, microUSB and Bluetooth connectivity. The Ziox Astra Young 4G is powered by a 2200mAh battery which can enable the smartphone to run for a day on average use.